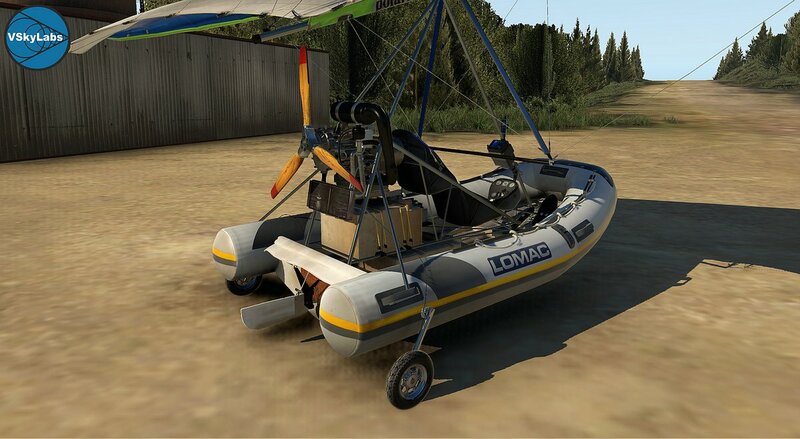 The VSKYLABS Polaris Motor AM-FIB ("Flying Inflatable Boat") development for X-Plane was approved by 'Polaris Motor', allowing a great deal of reference materials and operational practices to be included in the design, modeling, engineering and development process. 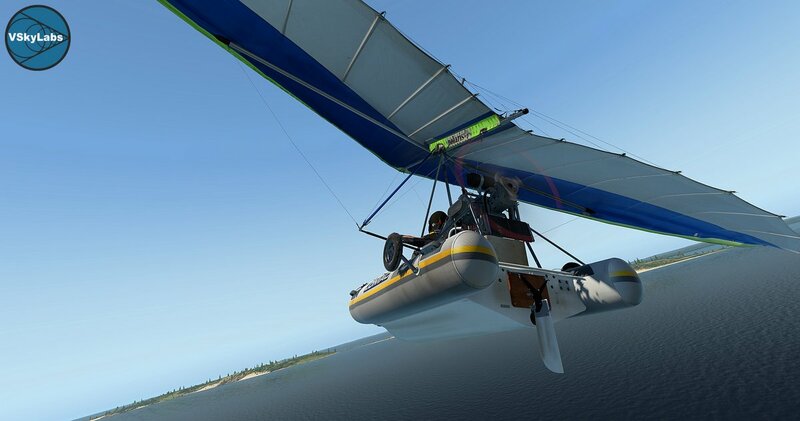 During development, first-hand materials and so-many detailed photos of practically every part of the FIB were shared by Polaris Motor company, for the purpose of this project (the VSKYLABS Polaris Motor AM-FIB for X-Plane is an independent project, which is not endorsed and/or affiliated with/by 'Polaris Motor'). 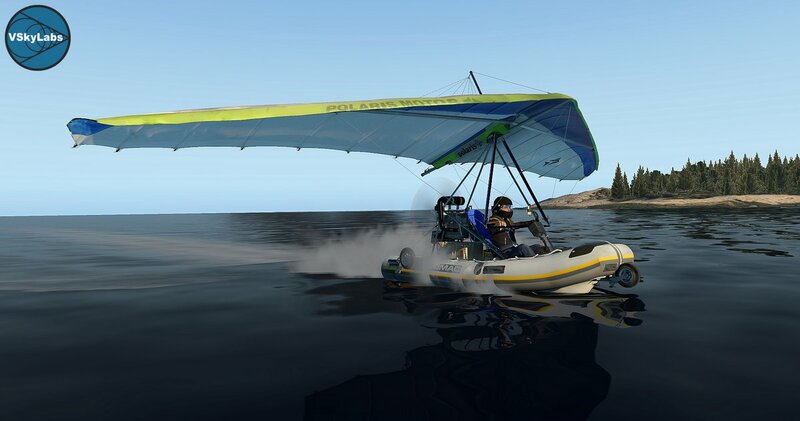 An ultralight trike aircraft, also known as a flex-wing trike, weight-shift-control aircraft, microlight trike, delta trike or motorized delta plane, is a type of powered hang glider using a high-performance Rogallo wing coupled to a propeller-driven three-wheeled undercarriage. 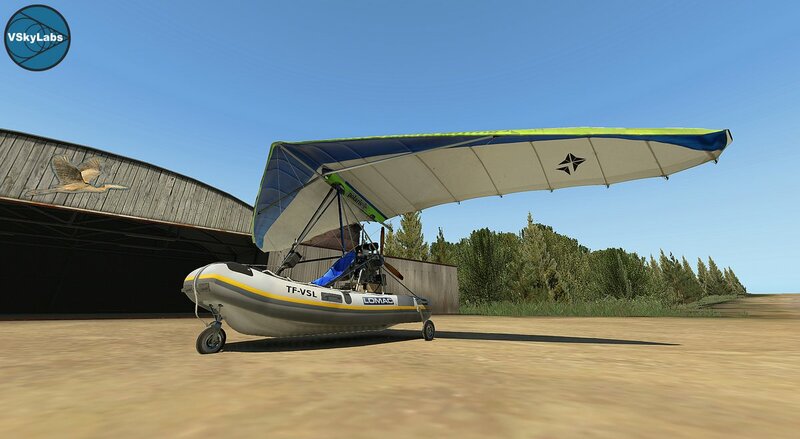 While many powered aircraft have three-wheeled landing gear, the term "trike" refers specifically to the form of aircraft described above. 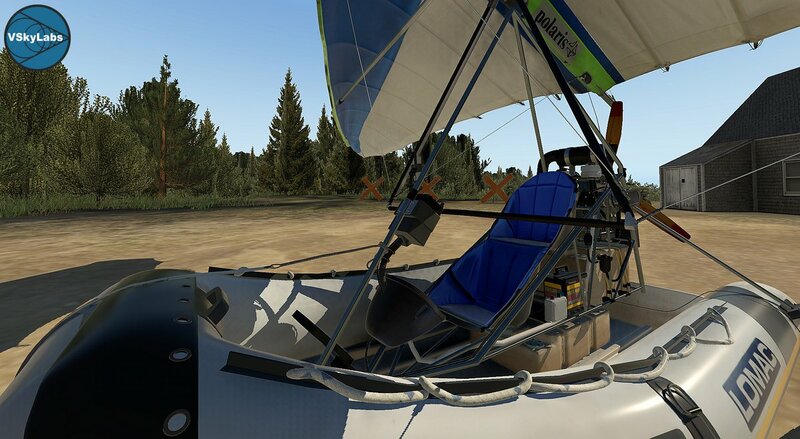 Flight control in a trike is made by weight-shifting; the undercarriage structure is connected to the wing at a hinge-point, and the wing can be tilted in both X and Y axes. While on the ground (takeoff for example), pushing the wing control bar raises the angle of attack of the wing and lift is produced. As the aircraft is airborne, moving the control bar of the wing causes the undercarriage to swift both sideways or back and forth, and a weight-shifting control is achieved. Thorough instructions, project evolution and design details are available in the project’s page at the VSKYLABS portal. 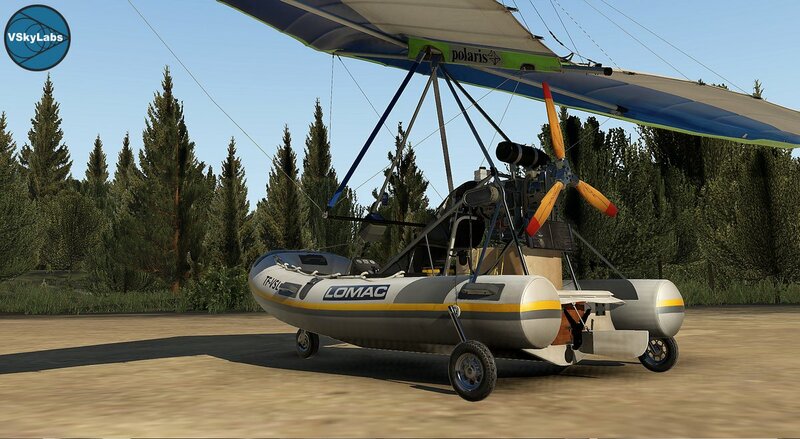 Highly detailed, fully animated realization of the Polaris Motor AM-FIB Amphibious trike. 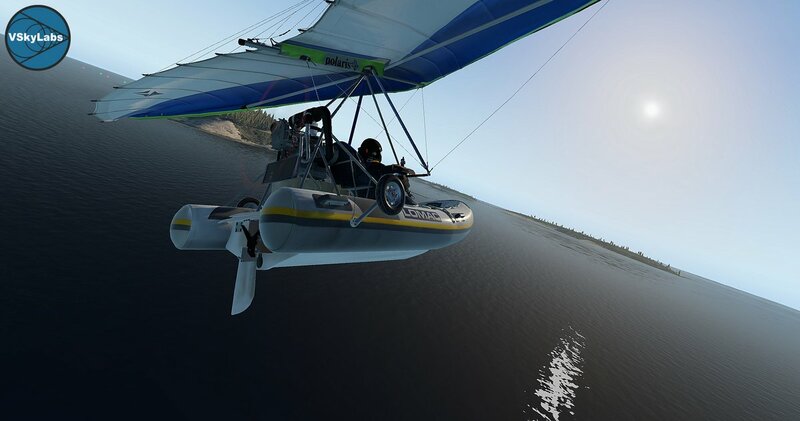 Land and sea operations in a single model, transform from land to sea configuration as you fly. 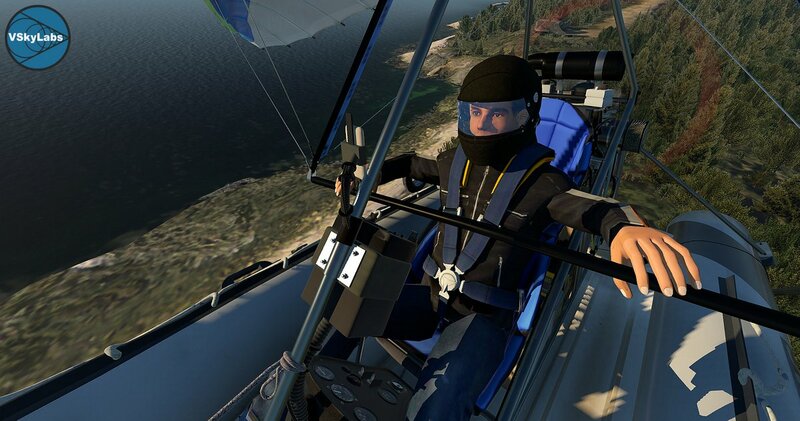 'Fly by Mouse' feature to simulate the movement of the control bar for actual Hang Glider flight training (no changes in X-Plane’s joystick setup is required to enable it). Pilot object could be instantly hidden or not, for maximum 360 degrees field of view. 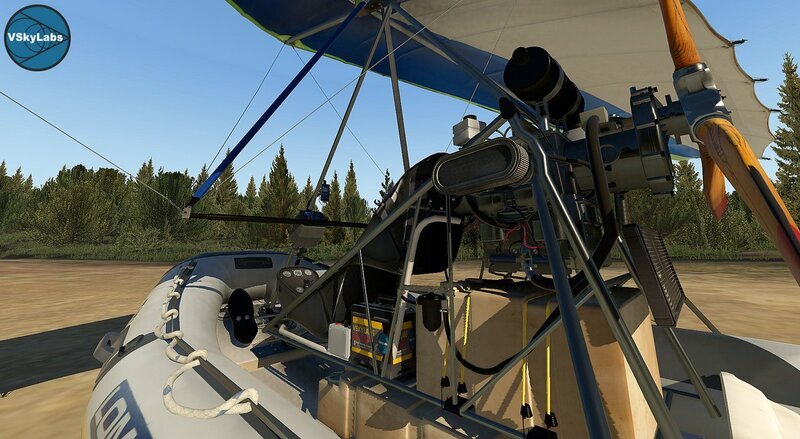 Easy Field of View toggle during flight. This is a project which is under constant development. All updates are free. fix to joystick throttle command issues.